Something so simple and yet so critical to human evolution, survival, and culture - the garden - is still one of the most popular attractions for travelers around the world. Botanical gardens feature on many a tour itinerary, and they are wonderful, often historical places to learn about a country's indigenous flora and fauna. Then of course there’s the perfectly delightful English gardens, the manicured hedges of France, the peaceful and intentional zen layouts of Japan, community gardens where you can help volunteer, and gardens that are simply so beautiful and grand that you’ll want to stay forever. The chateaux of the Loire Valley are some of the most beautiful castles in some of the most beautiful countryside in the world. 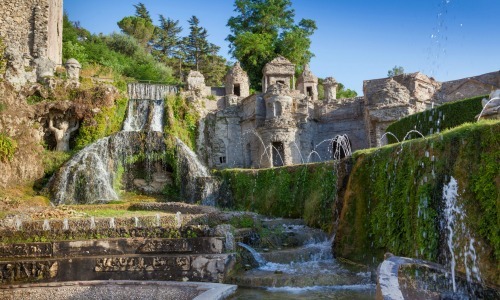 The gardens are a huge draw when visiting these incredible places, all idyllic, lovely, well maintained, and easy to imagine yourself back to the days of the renaissance. However, one in particular stands out: the gardens of Chateau Villandry. Known for its delightful abundance of vegetable gardens, herb gardens, grape vines, and fruit trees, as well as the classically manicured hedges. Visitors to Chateau Villandry typical come for the gardens, which are open year round, but the castle itself is also well worth exploring. Among its historical claims to fame, it is the location where King Richard the Lionheart of England met with King Philip II of France to discuss peace negotiations in the 1300s. Loire Valley Cycling with Explore! 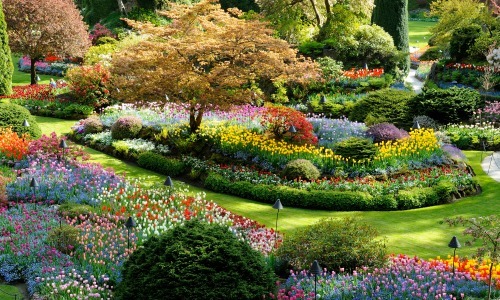 Few gardens are as eclectic and magical as Butchart Gardens in Victoria, Canada. Exhibiting numerous international influences, the garden is a masterpiece of enchanting allure. Bright colored flowers and multiple pathways winding through create an otherworldly feel - quite Oz like in it’s technicolor brilliance. Set against hills of classic Canadian pine forests, the garden was established in the early 20th century when Jennie Butchart began working to rehabilitate the land exhausted from her husband’s limestone quarry. Today it stands firm as one of the world’s most beautiful and eclectic gardens. Located in Suzhou, an hour thirty minutes outside of Shanghai, this garden is a spectacular display of traditional Chinese garden styles. This garden is surprisingly small, which is one of the main things visitors go to experience. The way it is laid out is specifically designed to appear larger, and the illusion is stunning. The Master of Nets garden dates back to the Song Dynasty (1127-1279), when it was first conceived and created. Over the centuries it has been built upon, though maintaining its intimate size, and was fully restored in 1765. This garden is like it’s own little world - with mini waterfalls and a forest like atmosphere, so created by the high walls surrounding the garden space. You feel like you’re walking through a different land. Situated on the shores of beautiful Lake Como, the villa and original gardens have been around since the mid 1500’s. Dotted throughout with sculptures and structures, the garden has a very long history, intricately connected with the many owners of the villa over the years. Construction of the garden went through many years of budget issues, major renovations, and changing ideas on its look, finally arriving at its current scale, size, and design in the late 1800s. 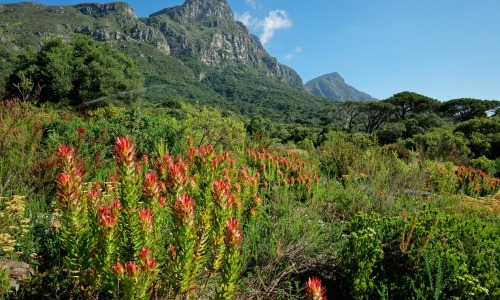 South Africa is known for many wonderful attractions, but perhaps less so for the beautiful Kirstenbosch Botanic Gardens. With a network of elevated paths throughout, and with Table Mountain rising in the distance, it’s the perfect place to get lost in for a few hours one afternoon. Many tours to South Africa feature this garden during their time in Cape Town. First founded in 1913, the focus was to preserve the indigenous plants of Africa, a model that was copied thereafter as cities around the world began implementing their own botanical green spaces. The classic English garden is what a lot of people are so excited to see when they visit the UK. Brings to mind a romantic elegance, and Jane Austen esque witty repartees over a nice cup of tea. There are some tours of England that focus exclusively on the country’s many idyllic green spaces and homes. 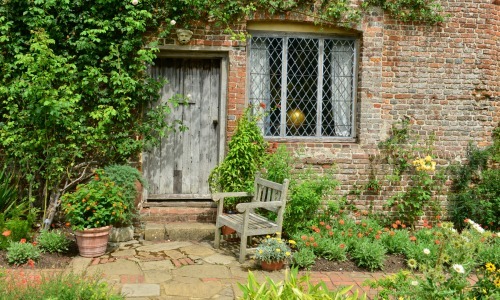 Kent is perhaps the most famous county for quintessential English gardens. Quaint country homes, with crawling ivy, wildflowers, lovely vegetable patches, fountains and stone walkways are the highlights. Although the sun may not shine regularly in England, these country gardens are anything but gloomy. The literal translation of the name? Garden of Heaven. With a name like that, you can certainly expect one of the world’s most beautiful gardens. This garden was literally built to rival heaven, by an Arab king in the mid 13th century. 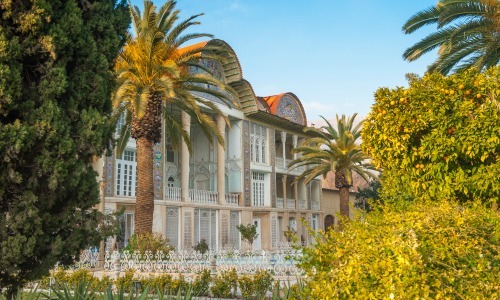 Walking through the ancient trees amidst water features, and lush plant life, it’s not hard to imagine the early Persian kings strolling through the garden. As dynasties came and went, the garden went through a number of restorations and changes, particularly with respect to the main building’s structural elements. Treasures of Iran with Explore! The enormity and grandeur of this garden are what you go to see. Part of the palace of the same name in St. Petersburg, Russia, the garden is incredibly long and decorated with ornate gold statues and fountains. 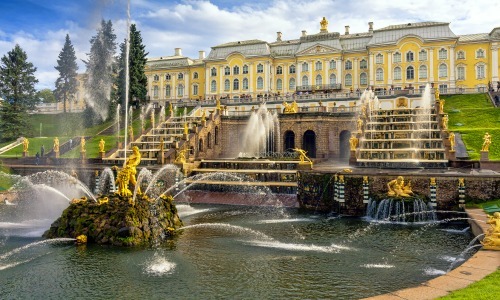 More a grand feat of landscaping than a garden, it is often called “the Versailles of Russia” it’s easy to see where the classification comes from. This was among the first great estates to be restored to former glory after World War II, and today remains a popular tourist attraction. (The garden however is sometimes still called by its germanized name “Peterhof”). Moscow and St. Petersburg with Explore! 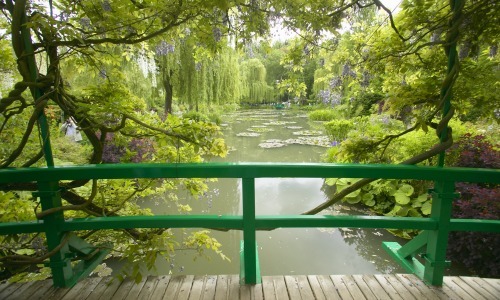 Not only one of the most beautiful gardens in the world, but also one of the most historically significant. Monet’s Water Lily paintings ushered in the age of impressionism, an artistic style that challenged almost every single popular opinion on art and painting of the day. Monet’s use of shape, color, and soft lines, allowed his paintings to express a feeling rather than strict reality. 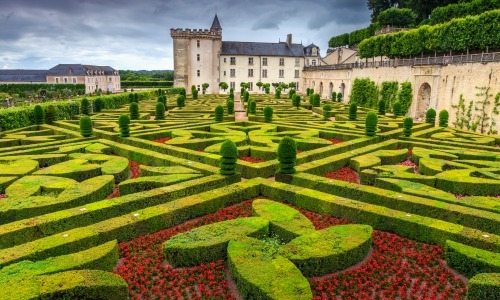 The gardens that inspired him are a frequent stop on tours of France. As you stroll around the idyllic lily ponds, it’s easy to imagine yourself back to his time and place in the mid 1800s. Nearby you can visit his house, where he lived until 1926. The residence is designed to appear just how it would have looked during his life. 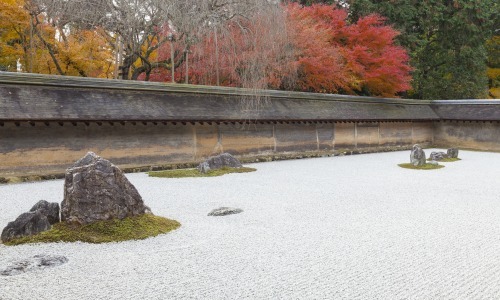 Beauty in simplicity gains all new meaning in this traditional Japanese rock garden. While it may not spring off the page with intense splashes of color or variety, the beauty is in the meaning and symbolism. 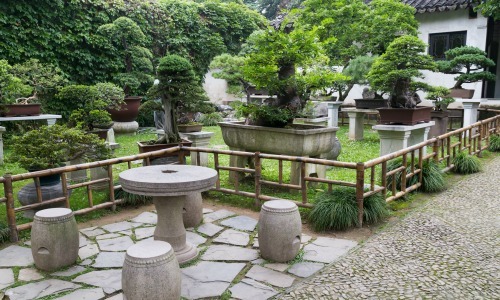 Rock gardens are designed very specifically and traditionally throughout Japan. They are designed to depict the journey of life, from birth to death to nirvana. Walking through it becomes incredibly apparent just how much we all share in the human experience. Photography is not permitted in many of these gardens, which are ticketed experiences. Putting the camera down is helpful; letting the spirit and culture behind the garden remain front of mind. Highlights of Japan with Explore!